I would like to define the pilgrimage as a single place, which is “geologically” unique, relatively remote, and requires some difficulty to get to. If you have already done your geological pilgrimage, please share with us your experience. If you are still planning your pilgrimage, then let us know where your sacred geological spot is and why. Perhaps this is cheating, but instead of a geographic place, I’ve chosen a ‘place’ in Earth history — the Late Cretaceous (oh, let’s say the middle of the Campanian stage, about 75 million years ago). Like many sedimentary geologists I’ve spent a lot of time thinking about this 35 million year-long (100-65 Ma) epoch. Whether its related to a class project during grad school, reading about new studies, or doing their own research, most stratigraphers end up pondering the landscapes of the Late Cretaceous at some point. Several years ago, while working on a master’s degree in Colorado, I spent a lot of time climbing around on sediments deposited during the Late Cretaceous that are now cropping out as dusty mesas and hogbacks in Utah and Colorado. The famous Book Cliffs outcrops in central Utah is one of the best places in the world to learn about and to debate the concepts of stratigraphy. More recently, I’ve researched and published about sedimentary deposits in the far south of Chile, also deposited during the Late Cretaceous. We can use sedimentary rocks to reconstruct ancient environments — and we can do it pretty well — but there is obviously uncertainty in these reconstructions. With this pilgrimage I’d love to fly over some of my favorite Late Cretaceous landscapes in a helicopter, just so I could see what it was really like — to see all the wonderful detail and nuance that ends up simplified and generalized. Why are there so many studies on outcrops of Cretaceous rocks in the stratigraphic literature? Why do sedimentary geologists focus so much on rocks from this time period? The simplest answer is because there is a lot of preserved sedimentary material from the Cretaceous. 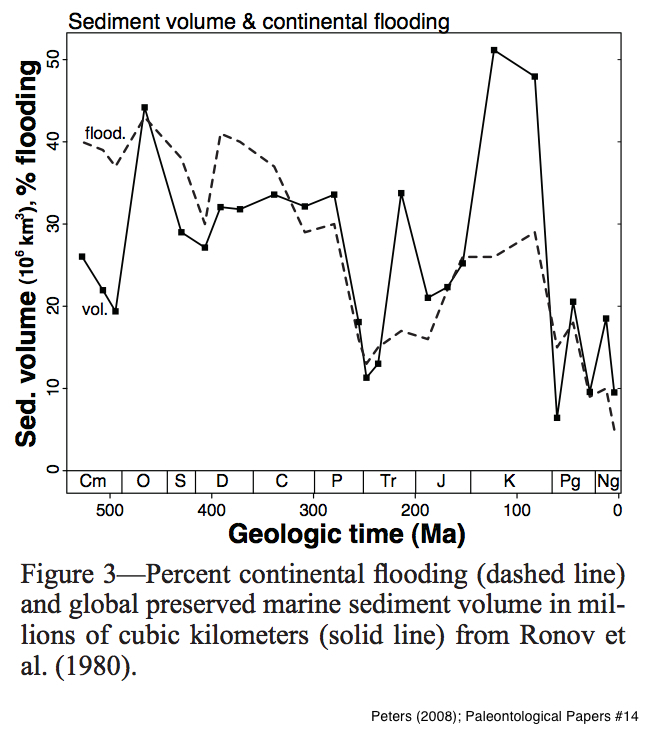 The diagram below, from Peters (2008) [PDF], reproduced from Ronov and others (1982), shows the global volume of preserved marine sediments (the solid line) through time. As you can see, the Cretaceous, denoted by the ‘K’ along the horizontal axis, is the big winner. The Cretaceous was the most recent time when the continents were flooded by the global ocean. Take another look at the paleogeographic map above, note the shallow sea connecting the Arctic Ocean to the Gulf of Mexico. In general, marine environments are great places for deposited sediment to be preserved. Combine a place to put sediment with an ample supply (from eroding mountain belts nearby) and the result is a thick pile of strata. These strata up on the continental crust can be relatively well preserved and accessible as outcrops. As the diagram indicates, there are older time periods that had more significant continental flooding (the dashed line) than the Cretaceous. However, because they are from an even more distant geologic past, many of these areas have been subjected to tectonic reorganization. The Cretaceous is recent enough such that these longer-term cycles of super-continent construction and breakup haven’t sliced, diced, cooked, recycled, or otherwise consumed the strata. In other words, several aspects of geology have conspired to produce one the best preserved periods of Earth history. And it’s not just stratigraphers who love the Late Cretaceous — all that preserved sedimentary rock hosts the fossils that paleobiologists use to address questions about the evolution of life. You can’t have the fossils without the rocks. I wonder how much less we would know about dinosaurs if not for the level of preservation of Cretaceous strata. Even if we can’t literally travel back in time to visit the Late Cretaceous, we can continue to learn more about it and improve our reconstructions of this unique and remote place in Earth history. Don’t think I’d ever realized there was another arm of that epicontinental sea open to the N Atlantic across the modern area of Hudson Bay. Good stuff. This is an interesting read. By the by, I would choose The Burgess Shale – the most famous and best fossil field – as my place of pilgrimage and I hope to undertake this pilgrimage in the near future. Ah, the Book Cliffs. I live at the foot of them in Colorado. I even live on Bookcliff Avenue. I got my geology BS degree right here at the little local college so I saw a lot of the “Books.” As a student I got a summer job mapping a quad with the CGS. I spent a lot of time in the Mancos Fm., described in some works as “monotonous.” As I learned to distinguish some of the different members of the Mancos I began to appreciate what an interesting and dynamic system the Epicontinental Seaway was. I too have a certain afinity for the Late K. Although I also ponder on the Late Devonian, but that’s mainly because I have an interest in source rocks, and that’s where a large majority of them come from. I currently spend the better part of my day looking at log signatures of the marine deposits from the Late K and can only day dream about what that Cretaceous seaway was really like. The colors of the coccolith blooms, the waves, the islands..ahh time travel can’t come soon enough.